This site was created because Bill Hartland's great original site about HMS Gambia that was active from 2003 disappeared in 2014. The remains of that can still be found on the Web Archive. In late 2016, I thought I'd try and resurrect the site. 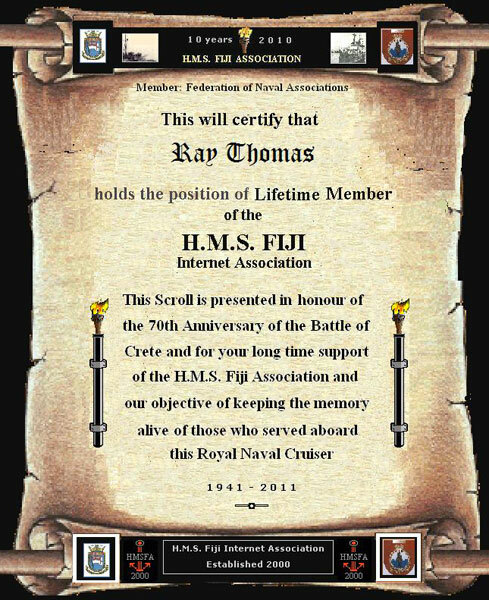 The Web Archive unfortunately did not archive many of the larger images but most of the text is still there and so this site is a mixture of Bill's original, pages from my own site which are about my own father's service on HMS Gambia, and new material I have been able to find. Bill had a lot of material on his site but unfortunately the Web Archive was not able to collect all of it. We are hoping to make this site as comprehensive as we can, so if you have any material at all that can help, I really would appreciate it if you could contact me at brisray@yahoo.co.uk. Since 1999, a lot of people have helped provide content, especially images, for both my and Bill's original sites. Without them neither site would have grown or be as interesting as they were or are and we thank them for taking the time and effort to contact us. This site contains the content from both our sites as well as new material that has been sent to us. Other material has come from various public domain and creative commons sources such as Wikimedia Commons and the Imperial War Museums. Where I have used information and ideas from other websites, those have been acknowledged on the pages the information was used. The site is mostly edited in Adobe Dreamweaver. Audio clips were edited in Audacity or Adobe Soundbooth. I have tried to make the site as responsive to different devices as I can. The main menu was adapted from Medialoot's "Responsive Navigation Menu Using Only CSS"
The image and media galleries are dependant on Fancybox v2.1.6. 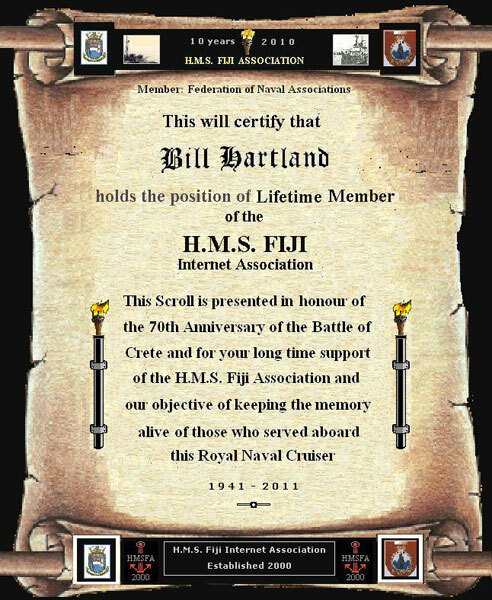 For his work on the original HMS Gambia Association website, Bill Hartland was made a lifetime member of the HMS Fiji Internet Association. In July 2017 I was given the same honour for my work on this one. Len Bloomfield was a well-respected, decorated Royal Marine and he needs his own page. Commanders - find more biographical information. Addison Joe Baker-Cresswell who also commanded HMS Bulldog when he captured U110 and an enigma machine. I need to search https://issuu.com/ and http://doczz.net/ for whatever articles they have about the ship. Another source is Trove of the National Library of Australia. I have an account here and can correct the OCR text. I need to go through the original HMS Gambia website's guestbook to get more information. Go through Commission Books and https://web.archive.org/web/20170125082450/http://www.rjerrard.co.uk/royalnavy/gambia/gambia.html to update Timeline page. Write a short introduction to each commission page showing the order of the places visited and events using the Timeline and information from the Commission Books. Once the 1950/2 commission page is done, write separate crew pages for dad, Ken Booth, Alan Goodwin, John Richard Hill, Jock Kerr, and Miles Rivett-Carnac. A longer term project would be to create a 3D model of HMS Gambia from photographs of her and the other ships of the Crown Colony class, using some of the software listed on the Wikipedia Photogrammetry page. Create XML Sitemap file of images and documents so the site can be indexed fully - especially by the Internet Archive so it can be preserved. I didn't realize that some of these pages would be so long. I need to rewrite the menu to include sub-menus. I am currently using an adaption of Medialoot's "Responsive Navigation Menu Using Only CSS" but it needs to look more like the one at W3bit's "CSS-only Responsive Multi-level Navigation Menu". W3Bit's mobile version needs to be clickable across the full width of the menu items. This was done in March 2017. Even with sub-menus the list of crew biographies was getting out of hand. They were all replaced a subset of the crew list table. The table uses Google Charts and is driven by a spreadsheet in Google Docs. This was done in January 2019. All the documents I have are now scanned but I need to tidy them up, make the text searchable and get them on the website. The documents include Ken Griffin's service records, the Commission Books for 1955/6 and 1958/60 as well as the 1953 Coronation Review program. All these documents were added to the website in March 2017. The crewlist now has clickable links for crew members that I have information for. This was done in April 2017. The table uses Google Charts and is driven by a spreadsheet in Google Docs. The crewlist now has a date slider to allow the user to choose to filter the list by the year someone started their tour of duty. The code for the slider is based on Google Chart controls. This was done in April 2017.